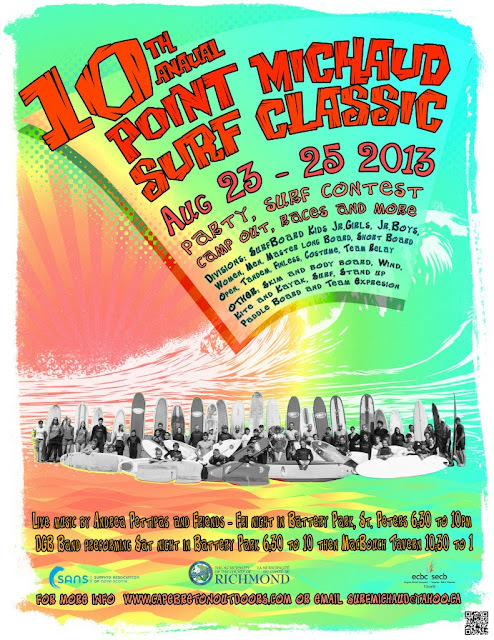 COME ON OUT AND ENJOY THE FUN AND EXCITEMENT AS SURFERS OF ALL AGES AND LEVELS TAKE TO THE WAVES FOR THE 10 ANNUAL POINT MICHAUD SURF CLASSIC!!! Battery Provincial Park, St. Peters. 6 pm to 10:30 pm: Pre registration party. Acoustic music with Andre Pettipas and Friends around campfire. Kid surf movies in tepee. Snacks. Award and sponsor prizes on display. Event is open to the general public. Group campsites available in event area or throughout park. Point Michaud Beach, Point Michaud. Everyone is invited to spend the day at Point Michaud Beach for the end of summer celebrations. Cheer on the surfers competing and enjoy the show. There will be lots of action to witness or be a part of. 1 pm to 3 pm: Sprint and endurance races in water and on beach. Contact Michelle Richards at surfmichaud@yahoo.ca for more details.